Fourth Row Center: Film Writings by Jason Bailey: New on Blu: "The Saphead"
New on Blu: "The Saphead"
The trouble with The Saphead is that it’s not a Buster Keaton movie. This is no great crime, in and of itself; Citizen Kane isn’t a Buster Keaton movie either, but it’s still worth a spin every now and again. However, The Saphead stars Keaton—in his first feature film role—and doesn’t give him much of anything to do, which is (let’s face it) something of a crime against cinema. Because he is in it, the picture is worth seeing (there’s very little he’s in that isn’t), but let’s face it: if Keaton weren’t the star, it surely wouldn’t get the deluxe Blu-ray treatment. The setting is “a little street where money is everything—and everything is money,” circa 1919. Keaton plays Bertie “the Lamb” Van Alstyne, the rather dense son of Wall Street tycoon Nicholas Van Alstyne (William H. Crane). Bertie’s not a bad guy, he’s just not good for much, and his man-about-town shenanigans are proving an embarrassment to his father, who threatens to cut him off. (Sound familiar? One wonders if Arthur writer/director Steve Gordon was familiar with the film.) He’s particularly resolute to cut ties when he discovers Bertie plans to marry his ward, Agnes, whom he “has brought up as his own child.” That’s a little icky, but the script doesn’t seem concerned, it was a different time, etc. Bertie’s story is rather clumsily contrasted with that of his brother-in-law Mark Turner (Irving Cummings), who seems a successful broker and family man, but is in fact a crooked chisler and philanderer, hiding a mistress named Henrietta and an illegitimate child. When Henrietta dies and their daughter shows up to expose Mark, he smoothly shifts the blame to Bertie; the family believes Mark, and when Mr. Van Alystyne goes on vacation and turns over power of attorney to Mark, the weasel tries to make off with the family fortune. The Saphead is based on the Broadway play The New Henrietta, where Bertie the Lamb was played by Douglas Fairbanks, who then spun the character off into his early pictures. 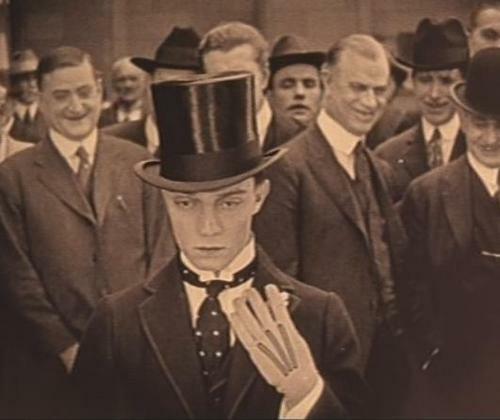 Fairbanks himself suggested Keaton for the film, but it’s an odd fit, taking precious little advantage of his unique gifts. The film itself suffers from the same problem as so many stage-to-silent-film adaptations: theater of the 1910s and 1920s was mostly preoccupied with dialogue, the one thing you can’t put across in a silent picture. As a result, all of that plot and talk ends up being conveyed on title cards, and the actual on-screen action is mostly comprised of people standing around talking, which is not terribly thrilling, aesthetically speaking. With all those story machinations grinding away, and all the purely expositional scenes and dialogue to connect them, it’s just not much of a movie, and it gives Buster little opportunity to do what he does best. Yet, it’s worth seeing (at least for fans). Keaton appears to have taken his cue from the distinguished cast (Crane was a Broadway legend) and the lack of knockabout comedy, and creates an honest-to-goodness character here, one different from the all-purpose Buster persona he’d honed in his short films. There is a stillness to his solemn work here, a confidence to the characterization, that highlights the difference (already striking within his body of work) between his inverted, naturalistic acting and the gesticulating melodramatics of the bulk of his contemporaries. And he does get some funny bits: watch his genuine surprise and humbleness when he’s handed his $38,000 in gambling winnings (“Are you quite sure you can spare it?” he asks), or his wonderful reaction when he thinks Agnes is turning down his wedding ring, when in fact she’s merely removing her glove so it fits properly. The Saphead only really comes to life in its high-energy, bustling finale, in which Keaton is set loose on the New York Stock Exchange floor and allowed to do some frantic physical comedy. On its way to that terrific sequence, viewers have to wait through a good deal of less than compelling melodrama and clunky storytelling. It’s mostly of value as an interesting curio, an opportunity to see one of the silent screen’s great clowns learning how to adapt and conform his persona for feature-length film—which he did, and masterfully. "The Saphead" is out tomorrow on Blu-ray in a new "Ultimate Edition." For full A/V and bonus feature details, read this review on DVD Talk.